Best Smoothie Makers 2018 - What's Goin' On In The Kitchen? Everyone at some point in the not too distant past has decided they absolutely must get a smoothie maker. However, choosing something like a smoothie maker can be a difficult task as there are so many on the market, and each has it’s own pros and cons. Here at What’s Going’ On In The Kitchen? 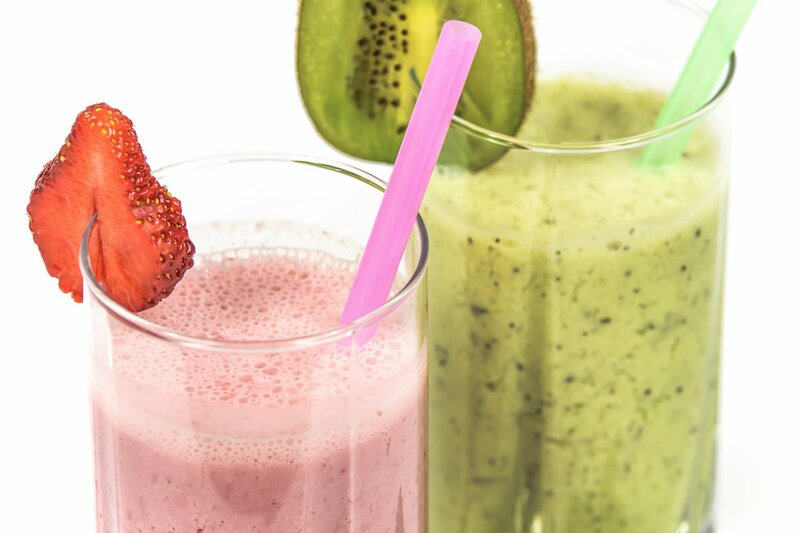 we have put together a Best Smoothie Makers 2018 buyer’s guide to help you with this difficult choice. You will find our review covers all the pros and cons of each, as well as looking into the technical specifications for each smoothie maker. This smoothie maker is one of our favorites, because it is low on price and big on usability. It’s patented extractor blades mean you really do get the most out of the ingredients that go into it, so for the health enthusiast on the go this is a must have product. Once you have smashed your way through the fruit and vegetables to make your smoothie, you are ready to go, simply snapping on the included lids to the cups you have just used for blending. This seriously cuts down on the amount of cleaning you need to do. This smoothie maker also comes with really great health and nutrition guides that are a must have for those wanting to get the best out of this smoothie maker. It is true that this product is not a food processor, and without the power of some of the other products on our list it will not blend ingredients to as smooth a consistency as some of the others will. Using it in short bursts rather than prolonged blending will keep the motor from suffering from burnout. If you are looking for a quick, easy to use and easy to clean smoothie maker to just get those ingredients down your throat then this is the smoothie maker for you. It’s a top seller on Amazon for a good reason, and should definitely be in a review of the Best Smoothie Makers 2018. It’s well made and portable, but as mentioned does not give the smoother consistency of some higher priced models. Having said that it does come with some pretty awesome recipes and nutrition guides. This smoothie maker is without question one amazing product. With a whopping 1560 Watts in its 3 peak horsepower motor this smoothie maker will blend and crush anything you choose to go into your smoothie. The Blendtec Total Blender comes with 6 pre-programmed cycles including batters, ice crush, smoothie, ice cream, whole juice and hot soup, meaning not only does this make amazing smoothies, but it can also be used for so much more. Using the included programmes ,you simply just press the button and let this machine do its thing. The thing I love best about this smoothie maker over some of the lower end products on the market is the consistency achieved in making smoothies. Using tough ingredients such as nuts and ice proved no problem in making a smoothie with the kind of consistency I was looking for. I have a thing about consistency of food and don’t even like those little bits in fresh orange juice. With this smoothie maker I am able to get the consistency I love in a smoothie. Another plus point for this machine is the massive 213 page recipe book that comes with it. If you are stuck for ideas and not sure exactly how to get the best out of this smoothie maker, then this is a great place to start. Finally I need to mention the warranty that comes with the Blendtec. Most other smoothie makers and blenders come with a 1 year warranty. This product comes with a 7 year manufacturer warranty, so should anything go wrong with your smoothie maker you know you will be covered. If you are serious about your smoothies and are going to use your smoothie maker a lot then this is the machine for you. The pre-programmed cycles are a must have, and the high powered motor makes smoothies with an amazing smooth consistency. It is true that this is one of the more expensive smoothie makers on the market, but we feel this price tag is justified. With its power and cycles this is so much more than just a smoothie maker, and with the warranty you can feel secure in knowing that high price tag is covered should anything go wrong. For the price tag this is a surprisingly high powered and well made device. Coming in much cheaper than the previously mentioned Blendtec and much more powerful than the Nutribullet discussed above, we feel this smoothie maker is worth a look in for the smoothie connoisseur. This smoothie maker has a powerful 110o Watts base, which is pretty powerful compared to other smoothie makers with a smilair price tag. It also comes with a huge 72 oz. total crushing pitcher, which really is capable of turning huge chunks of ice to slush in seconds. The two 16 oz. cups and to-go lids are perfect for taking your smoothie on the go with you. For the amount of money you will pay for this, it really is well equipped. On the downside there are a few issues with consistency when making smoothies. The above Blendtec is capable of making super smooth drinks, whereas the consistency when using this smoothie maker was not quite as good. It also struggled to blend some of the leafy greens such as spinach that you may wish to use. This smoothie maker also comes with just a 1 year warranty, and searching around we found user experiences with the manufacturer to be a mixed bag. For us if you are looking for a good mid-priced, mid-ranged blender that is high in power and packed with accessories then this is the smoothie maker for you. Sure it might lack the punch of the Blendtec, but at around a quarter of the price you would have to seriously consider this product. With the added accessories that come with this, it is up there as one of the best mid-priced high value smoothie makers out there. This smoothie maker is a no-frills, simple and easy to use and clean product. It has a single speed setting with a pretty high-powered motor for its size and price tag. The machine is capable of blending the toughest of products, and performs well on leafy greens as well. We found that it did struggle a little on some of the tougher nuts we tested when making our smoothies. Crushing ice with this smoothie maker was surprisingly efficient for a smoothie maker in this range, allowing us to blend ice to a snow like consistency without the addition of liquid you can often be left with. The 75 recipe guide is a welcome addition to the unit, and is a good guide for those just starting out with a smoothie maker. In looking more closely at the construction of this smoothie maker, it does appear to be quite weak and it would be difficult to see how this would stand up to regular use. We also found this smoothie maker to be very noisy. Capacity: 24 oz. and 18 0z. For the price this smoothie maker is able to tackle tough ingredients and make a smoothie with good even consistency. Over a long period of time the construction of this product could be compromised with regular use, and with the 1 year warranty this could be a concern. For the price range that this smoothie makers sits in it is surprisingly high-powered. With 1000 Watts of power and several settings this product is pretty versatile. This smoothie maker has what the manufacturer calls ‘Total Crushing Technology’, which basically means it is capable of pulverising whole fruits, vegetables and even ice in mere seconds. The jar on this smoothie maker is huge at 72 oz. and can easily make smoothies and drinks for the whole family in one go. The unit itself has three different speeds for ice crushing, blending, pureeing and food processing. Also included with this smoothie maker is a useful set of recipes to get you started. It’s difficult to find any drawbacks with this smoothie maker for its price within the market. It does not come with as many accessories as some of the other models on the market, and like others tends to be pretty noisy, especially when crushing ice. That being said this is a good mid-priced blender packed full of professional power. This smoothie maker also comes with a limited 1 year warranty, and looking at user experiences online customer support can be an issue. For its place in the market this smoothie maker delivers high professional quality power and is capable of blending large volumes at one time. It comes with a good set of recipes, but is lacking in other accessories. If you are looking to not spend too much and still get a smoothie maker that offers good value for money and high power levels we suggest you take a look at this model. If you are looking to spend the bare minimum on an efficient single serve smoothie maker then this is probably the one for you. The 250 Watts power base is sufficient for whipping up simple single-serve smoothies, and with the included BPA free sports bottle you can make your smoothie and be ready to go in a very short space of time. The smoothie maker is sleek in design and does not take up much space at all in the kitchen, although there is an obvious trade-off of power between this and some of the bigger smoothie makers on the market. The lower power with this smoothie maker means that whilst it is good for pure smoothies, it is a real struggle to blend and crush ice for ice-based drinks. This product also comes with a nice recipe set to get you started on your smoothie journey. If you are looking for a super cheap single serve smoothie maker then this is the one for you. The cheapest on our list, this will make simple smoothies for you which will then be ready to go in the sports bottle. Anyone wishing to make ice-based drinks or smoothies for the whole family should take a look at some of the larger smoothie makers in our Best Smoothie Makers 2018 list. The Vitamix 5300 Blender is an extremely high powered device, with a whopping 1380 Watts of power. However, this comes at a cost, quite literally as this is one of the most expensive products of its kind on the market. Vitamix does often sell refurbished products on Amazon and if you can pick one of these up you will grab a bargain. This smoothie maker comes with a variable speed control and pulse function, meaning that you really are able to get the most out of the ingredients used. Unlike some of the lower powered devices we looked at, this device took even the toughest of produce and blended it into a drink of smooth and even consistency. For such a high powered device, this smoothie maker was also much quieter than some of its similar counterparts. Although it is at the top end price wise, what you are getting with this product is a seriously heavy duty and durable smoothie maker that should withstand regular use. If this isn’t enough, it also comes with a 7 year warranty, so the manufacturers must be confident in its ability to stand the test of time. A seriously durable and powerful smoothie maker, this is ideal for someone looking for regular use, who wants to make a variety of drinks for the whole family. It is at the top end of the market price wise, but for this you are getting a serious bit of kit accompanied by a 7 year warranty. If you’ve got the cash then you may just want to splash out on this one. The Nutri Ninja Auto -iQ blender packs a lot into its small stature and price. Being much lower in price than the Blendtec and Vitamix, we were pleasantly surprised with its features and performance. The power base is packed with 1000 Watts of power, and it performs well on a variety of produce. Whilst not blending to the high standards of the two smoothie makers mentioned above, it still comes pretty close in terms of smoothness. This product is accompanied by a great accessory pack with a recipe guide and three well performing portable cups of differing sizes and two spout lids. The Auto-iQ Technology features intelligent programmes that combine timed pulsing, blending and pausing patterns. This means you pretty much just have to choose the setting and let it do the work for you. The device also has a digital countdown timer for the programmes, which allows you to keep track of blending time when you use the two manual speeds. This blender certainly punches above its weight, both literally and in terms of price. It comes with a lot of accessories, and is perfect for someone looking for a more powerful smoothie maker to make drinks for use on the go. It is not for those looking to make smoothies for the whole family, or for those wishing to make thicker drinks such as sorbets. The clue to this device is in the title. It is a multi-functioning smoothie/blender that comes packed with accessories. The 48 oz. pitcher is perfect for blending and making smoothies, whilst some of the other accessories are great for food processing and chopping. For everything that this device is capable of, and everything that comes with it you would expect it so have a much higher price tag than it does. Unfortunately the trade-off comes with its power, or lack of to be more specific. Whilst it does make great smoothies with most fruits, it does not handle green and leafy products so well. Also if you want to add nuts to your smoothie they will need to be chopped separately, whereas some of the more powerful devices we looked at can handle these without a problem. There is a tendency for the motor to overheat with this product on tougher ingredients. A good cheap smoothie maker that can double up as a blender and food processor and is well equipped with accessories. Struggles with tougher ingredients and can overheat if used for extended periods of time. For its price this is a seriously powerful product capable of much more than making smoothies. Priced mid to high in comparison to other devices, this smoothie maker packs a huge 1500 Watts of power in its base. This product is extremely popular, and this is why we felt it should feature in this Best Smoothie Makers 2018 review. Along with the huge amount of power it packs, it also comes with a good amount of accessories. The 72 oz. Total Crushing Pitcher is capable of handling the toughest of ingredients, and will make smoothies and other liquid foods for the whole family. The two cups with to-go lids means you can also whip up your smoothies to consume on the go. The smoothie maker also comes with a 64 oz. food processor bowl and 30 recipes. Like some of the other devices we looked at, this one does struggle with foods like kale, and food often annoyingly gets stuck in the lid during use. If you liked our top ten best smoothie makers 2018, why not take a look at our top ten best slow cookers 2018?